In my home, Deir ez-Zor, the situation is worse than ever. "More than anything, I hope I hear from my mother and sister. I hope they are alive and have escaped the war zone." The last one to leave was my mother. I have not heard from her in almost a week and I do not know if she is still alive. I grew up in a small village in Deir ez-Zor, in northeastern Syria. I spent most of my life there until I fled to Germany on New Year's Eve 2014. Militant groups had taken over, executed hundreds of members of my tribe, and I feared for the lives of my pregnant wife and my two daughters. Bombs dropped on a daily basis, I lost count of how many friends and relatives died. As a male in my late twenties, various militia groups were targeting me. Many of my friends who decided to stay were killed. In the following months, my parents told me about public crucifixions, hangings and people who were pushed into graves and buried alive. I was in constant fear for the lives of my family -- there was no medical help and hardly any running water or electricity. I walked for days, endured a perilous boat crossing to Greece and passed through the dangerous transit zone in the Balkans. I am one of more than 5 million Syrians to have fled my home country since the conflict started more than six and a half years ago. I am also, as friends and family in Syria tell me, one of the lucky ones. I fled Syria at a time when I could still seek safety in Germany. 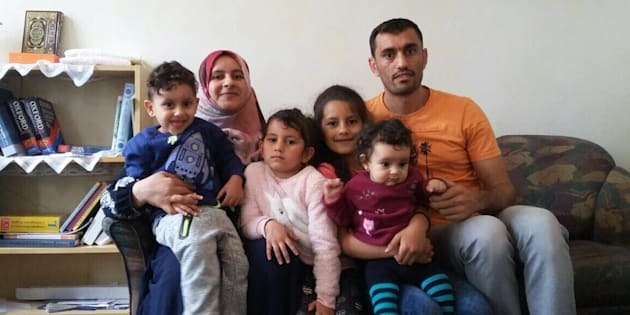 After waiting months to obtain a visa, my wife and children also journeyed on a rickety boat and were lucky to arrive before borders were closed. A few days ago, one of my cousins was captured by a military group. Another stepped on a landmine whilst trying to seek safety. I keep reading in the news: the war in Syria is almost over and there is no more violence. But the messages and videos I receive from friends back home tell a different story. When I message my good friend Mohammed, I say "How is your field?". For many years now we have only communicated with each other in this secret language. We know phones are tapped, and at any moment armed groups could turn up at his door. He tells me airstrikes and bombings happen every day now. The only people left in the villages are the ones who have already fled from elsewhere, some of them more than 20 times in the past six years. Many cannot afford to flee. It costs up to 2000 euro for a family to travel from Deir ez-Zor to Hassakaf, a safer area. They have to pay smugglers to pass checkpoints, hide children in trucks and bribe armed groups to pass. After years of war, they can only rely on people like myself outside the country to support them with money to pay for their path to safety. A few days ago, one of my cousins was captured by a military group. Another stepped on a landmine whilst trying to seek safety. Friends have sent me videos of their escape. They camp in the desert, shovel grave-like holes to sleep in and cover themselves with blankets and clothes to protect from the heat and the cold. My mother did not want to leave, even when my father finally decided to give up his home a few weeks ago. We all tried to persuade her to leave with Dad. But she stayed, along with my 12-year-old sister. Our village is all she has ever known. Our ancestors have lived there for centuries. She herded her sheep and cows and did not want to leave them behind. But a few days ago, armed men came to our house. They told her she did not need to live in a big house on her own. The last message I received from my mother was that she and my sister were passing the Euphrates River, on the edge of town. So here I sit, in Germany, safe. I have a job with the aid agency CARE, supporting children and teenage refugees. My family, with now four children, is safe. I have found friends and a job that fulfills me. Yet, every other minute, I check WhatsApp. I hear from family and friends, some of whom have fled many times around the country, who have escaped unimaginable horrors and who are now trapped once again. The war is not over. On the contrary, in my home, in Deir ez-Zor, the situation is worse than ever. I feel like this has been demanded so many times before, but I hope nothing more than for international humanitarian law to be abided. I so desperately hope an immediate ceasefire will save the lives of my friends like Mohammed and their families who are still there. And more than anything, I hope I hear from my mother and sister. I hope they are alive and have escaped the war zone.